"Celebrate Canada Day with a flag cake! Vanilla sheet cake with a whipped cream cheese frosting, decorated with strawberries to make the Canada Flag. This will feed a crowd! Serve with extra sliced strawberries if desired." Preheat oven to 350 degrees F (175 degrees C). Grease and flour an 11X17-inch baking pan with 1-inch high sides. Beat 1 1/2 cups sugar and butter together in a large bowl with an electric mixer on medium speed until light and fluffy. Beat one egg at a time into the butter mixture; beat in sour cream and 2 teaspoons vanilla extract. Sift flour, baking powder, baking soda, and salt together in a bowl. With mixer at low speed, add flour mixture to butter mixture alternately with milk just until combined. Scrape sides and bottom of bowl and finish mixing with a rubber spatula. Pour batter into prepared pan; spread to corners of pan and smooth top with a spatula. Bake in the preheated oven until a toothpick inserted near the center comes out clean, about 20 minutes. Cool cake completely, about 30 minutes. To remove cake from pan, run a paring knife between cake and pan. Cover cake pan with plate or cooling rack; invert to transfer cake onto plate. Beat cream cheese, 1/2 cup sugar, and 1 teaspoon vanilla extract together in a bowl with an electric mixer on medium speed until fluffy, about 2 minutes. Reduce mixer speed to low; slowly pour in cream. Once cream is incorporated, turn mixer speed to medium-high; beat until stiff peaks form, about 2 minutes. Spread cream cheese mixture evenly over top and sides of cake, smoothing the top. Place 2 to 3 rows of overlapping strawberry slices parallel to short sides of cake for the two red stripes of the Canada flag. Trace out a maple leaf shape in center of cake with a toothpick; use points of strawberry slices to create points of maple leaf. Cut a strip of strawberry for the leaf stem; fill in the area of the maple leaf with sliced strawberries. Refrigerate cake until ready to serve. A light, sweet, no-bake cheesecake topped with fresh berries. Cake can be decorated and served right in the pan for easier transport. If removing the cake from the pan, frost the sides and add sliced strawberries around the edge for a nice presentation. 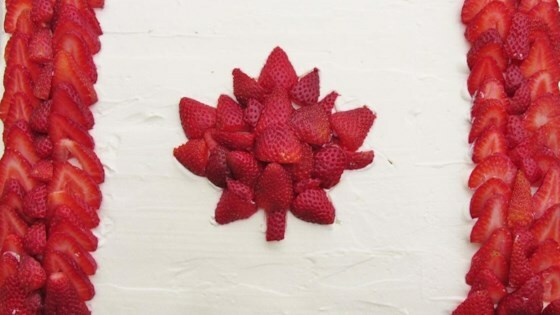 Raspberries can be used for the sides of the flag, but strawberries work best for the maple leaf. You can find Maple Leaf templates for your cake online. Store leftover cake, covered, in the refrigerator. This was the best vanilla cake I've ever made, and the whipped cream cheese frosting is magic. I was impressed, too, that the leftover cake was still in good shape the next day. This also makes a great Layer cake for any occasion! Put the batter in two 8 or 9 inch round cake pans and bake for 18-20 minutes.